What a beautiful card and cool technique! Happy Birthday PinkFresh! Love your card! It's so pretty. Super pretty! I bet they really shimmer in person! Oh..... those two Pinkfresh sets are just beautiful together! Lovely!! Such a lovely card. The colors are stunning and the the subtle sparkle is the cherry on top. 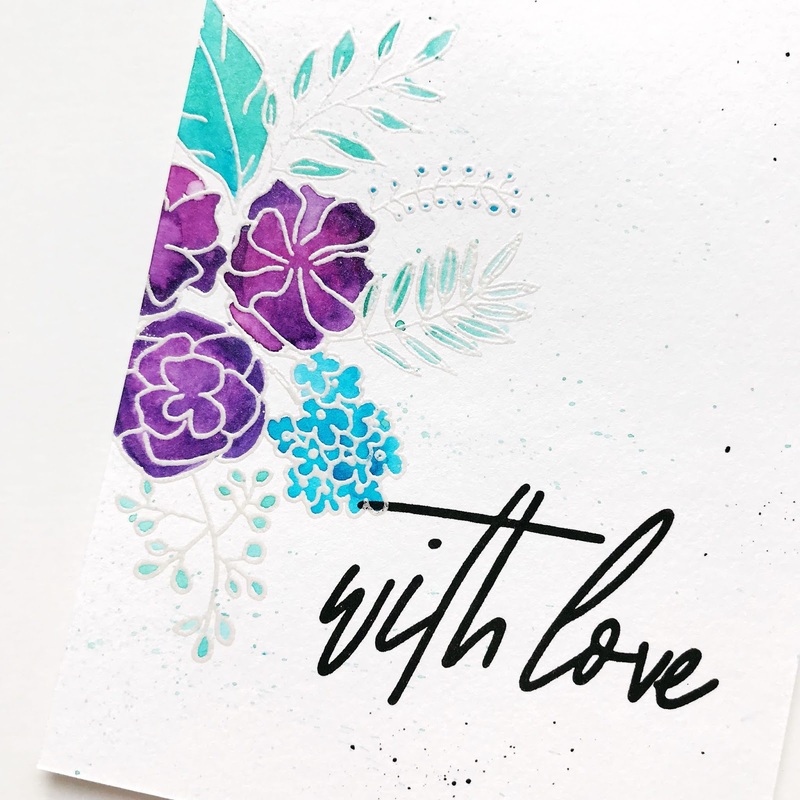 Beautiful cards and I love the soft look with the watercolor shimmer! So gorgeous! Great job. Wow! These are gorgeous cards!! Love the techniques you've shown. Gorgeous cards! Luscious colors!! Love the results using both techniques you demonstrated with the shimmer powders... thanks so much for the video showing these. I'm sold!!! Ever so pretty - love the shimmer. Love the watercolors! Beautiful cards! Wow! Those colors are so vivid and gorgeous. I love that bold sentiment too! Absolutely beautiful. The colors are magnificent. The shimmer is beautiful on these cards. You reminded me that I want to try the powders out. Love the embossing. The shimmer powder is really neat! Great card! Wow! I want to try some nuvo shimmer powder! Beautiful!! I love the white embossing--what a great touch! So pretty! Love the watercolors! These are absolutely lovely! I have never used the Nuvo drops, but I want to now! Simply lovely! Love how you did these! very pretty cards - it is fun to use old product in new ways, isn't it? and no, no you're not the only one who has random, mystery made backgrounds in a drawer, and pulls them out going, "when did i make this???" Carly I always love watching your videos because your laughter is so contagious! You are so bright and upbeat, and these cards are just the same! So beautiful!! Sweet combination of colors, love these! Love the watercolors! Just stunning! Such pretty cards! Love the flowers and colors! Beautiful cards.Thanks for sharing the whole process via video. Absolutely love your coloring, great inspiration! Oh, I just bought some of those powders, and I can't wait to play with them. Lovely card and wonderful inspiration! Beautiful cards! Loved your video process and I am inspired to have a go with the Shimmer Powders. Congratulations to Pinkfresh Studio on their 5th Birthday. Gorgeous cards. I only have one of the shimmer powders so far and funnily enough it's the violet brocade. I will have to try this technique. Oh my! I love both of your cards.........messy or controlled is fine with me. Thanks for sharing the video. I will have to get some of the shimmer powder. 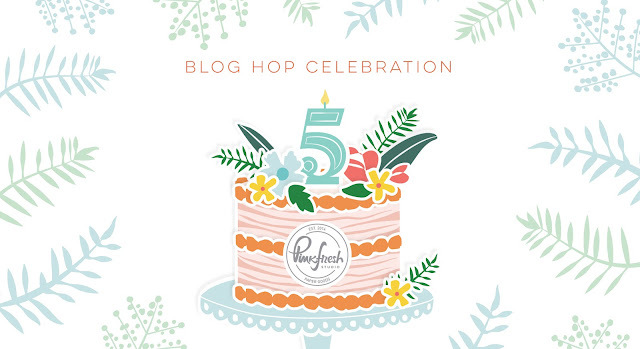 Happy 5th to Pink Fresh, wishing you another great year. Love your process. These colors look amazing together also. Happy birthday Pink fresh. Keep up the great work. Wonderful, love the color combo and your style with the Shimmer Powders. Thanks for sharing. The Pinkfresh floral stamps are so beautiful! I am loving the turquoise/purple color combo. You are one of my favorite card videographers (is that a word?) 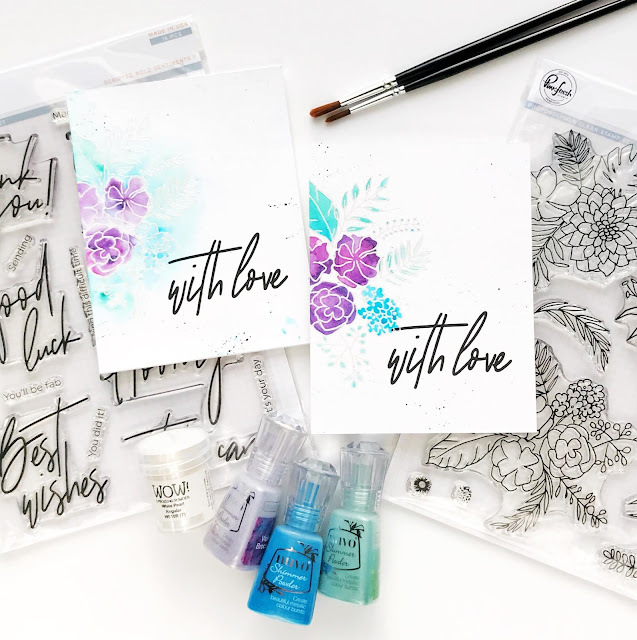 Your cards are gorgeous and your videos so a great job of showing the products and explaining the card making process. Carly, Lovely projects! Makes me want to pull out my NUVO products! Thanks for the inspiration! So pretty yet so simple! Can`t eait to give this technique a try. Thanks Carly! This is beautifully simple! Thank you for sharing! Beautiful card. I love the colours and the shimmer adda a great texture. 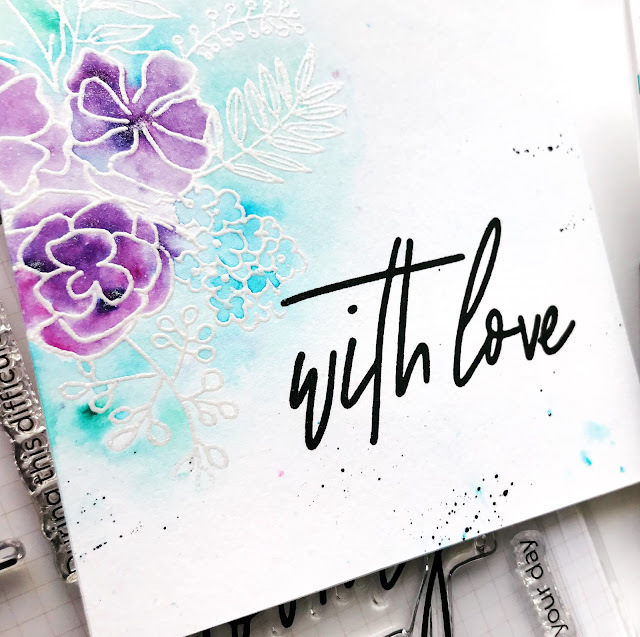 Gorgeous- so simple in design and yet with those watercolors the cards just pop! Wow. Ilove the CAS design of your lovely cards! So lovely! I am in love with these bold sentiments! I need to try these powders, your results are stunning! So beautiful! Thanks for sharing these materials and techniques! So so pretty—love those shimmer powders!! Beautiful cards! I really want to give these powders a try, thanks for showing 2 ways to use them. Beautiful cards, never heard of Nuvo shimmer powders, but love the results. So pretty with the embossing and these colors. Beautiful cards! I didn’t even know Nuvo made powders... on my to get and play list. I like both of your cards but I think I like the second one better. I like that the colors on it are more vibrant. I cant wait to try this technique out! Love the script on your card. Great technique, beautiful cards. Great use of the Pinkfresh Studio products. Wonderful job. Thanks for sharing your creativity! Wonderful cards and love the shimmer, Carly! 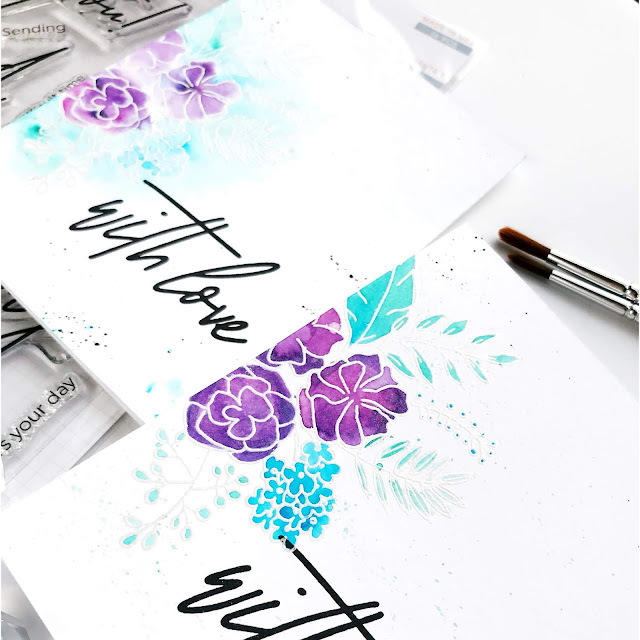 The font used in that sentiment is fabulous and is perfect for your floral images. Both cards are so pretty! I actually like the "messy look" the most, but watercoloring is still intimidating to me. You make it look so easy! I love your cards and I love playing with the shimmer powders!! They are so much fun. I don't have the violet but I have got to have it after seeing you paint with it!!! Carly your cards are fabulous! I love cards done with a CAS style & a loose watercolour look. My absolute favourite! Each time I see powders sprinkled & sprayed, I am in wonder at the look they give. I had no idea that Nuvo had released Shimmer Powders. Now I want some! Thanks! What pretty cards. I love how you made the flowers really bold, then let everything else be really soft. I'm always impressed when people can do loose coloring like that, and yours is particularly nice. Thanks for sharing with us! That looks so fun I think I could spend hours playing with those ink. I had no idea they were products out there like this. I'll be visiting your blog a lot. Love the color combo you chose and the stamp choice!! You know we all have those colored cards we set aside... right!! I love the Simplicity of your card. The color combination it's outstanding. Love the look of the messy watercolour card. Really like watching the video and your technique using the powered watercolour. Pretty cards and the colours are great. Love the beautiful cards. Powdered watercolours are new to me. So I really appreciate the video. Congrats to Pinkfresh Studio on completing 5 years. I love your products. Wishing you many more successful years ahead. Wow! These are so gorgeous! The Nuvo shimmer powders are new to me and I think I might need the Violet Brocade (some favorite colors there). Happy Birthday Pink Fresh Studio...here's wishing for many more! Gorgeous water colored cards, I love both the loosely colored one and the traditional one! Thanks for another awesome video. Fabulous cards. Love the colours. Love your style and those colors together! Beautiful colors and shimmery effect. Thank you for sharing your talents. Sweet soft colors. Mahalo for putting on such an awesome blog hop! I am in love with everything the design team has created!! Good luck everyone! Love how simple and elegant these cards are! So funny, I was just thinking of purchasing some shimmer powders yesterday, but had no idea how to use them so put it off. Voila, your tutorial video! Thank you for sharing! Unbelievably gorgeous!!! 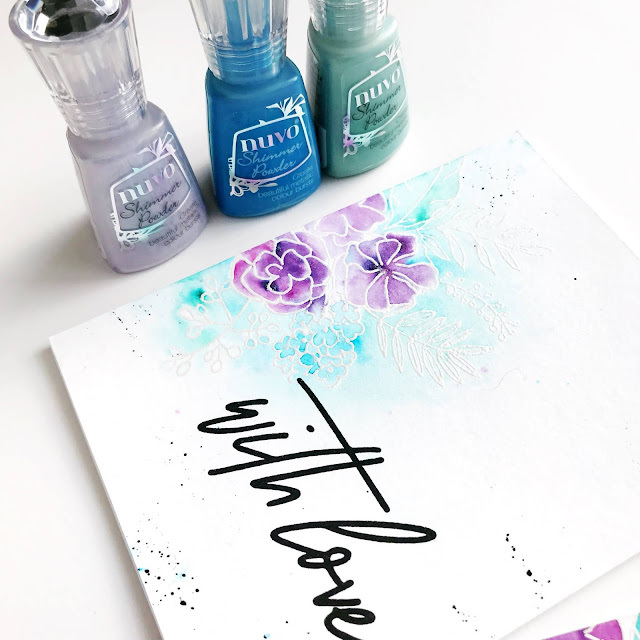 Those shimmer powders take the pretty watercolored flowers to a whole new level. Beautiful cards. Gorgeous! I love the clean designs and the organic movement of the watercolors. These are fantastic. Your cards make me want to grab these products to try immediately! Lovely designs. This is so pretty! Love the sentiment and how it looks handwritten! guilty! yes, I have a bunch of practice panels. luv how you completed yours! That is definitely a technique I have not seen before..... extra points for originality!